The Government has ordered strict handling of violations in the implementation of Build-Operate-Transfer (BOT) transport projects amid public rage over unreasonable toll booths and high fees. In its Resolution issued after the August cabinet meeting, the Government instructed the Ministry of Transport to work with the Ministry of Finance and other ministries and local authorities to review the total investment, toll fees and fee collection periods of BOT transport projects for reporting to the Prime Minister this month. The Government’s move follows the announcement by the Government Inspectorate of the results of its inspections of transport projects built under Build-Transfer (BT) or BOT contracts. The inspections of seven projects in the transport sector, including five BOT ones, found five major problems in their implementation. According to the inspection conclusions, the Ministry of Transport did not comply with regulations on the announcement of the list of projects calling for public-private partnership investment. Specifically, the announcement of the project list after its approval was made after the set deadline, which is January every year, negatively affected the selection of investors. In fact, no investor has been selected through bidding for all of more than 70 BT and BOT transport projects implemented so far. For the reason that there was only one bidder for each project, investors were all appointed even though some had limited capabilities and failed to meet project requirements. The inspections found that some investment decisions were inappropriate and inconsistent with the master plan while total investments of a number of projects were estimated incorrectly as a result of failure to comply with regulations in approving investment items, work volumes and unit prices. State authorities’ lax management in the selection of investors and contract negotiation, signing and performance supervision was also a reason behind investors’ inaccurate cost estimates. Investors of the seven inspected projects were found to inaccurately approve unit prices, salaries and allowances, which were over VND 316 billion higher than the actual level. The inspectors concluded that some projects were merely upgrading main and unique national roads in areas with high population and traffic density, turning locals into reluctant users as there was no other choice for them. To avoid toll booths, drivers chose alternative district-level routes not designed for heavy traffic loads, thus pressuring and damaging local transport infrastructure. The inspection conclusions pointed to high fees of some projects as a result of their impractical estimation of traffic flow, which was only made in a very short period of time but was used as the basis to set tolls for the whole period of operation of works. Under the projects’ financial plans, revenues were also estimated much lower than in reality, resulting in extended fee collection periods. The inspections showed that the locations of toll booths are not only unreasonable but also fail to meet with the minimum distance of 70 km required by the Ministry of Transport. This is caused by the fact that some projects incorporated road upgrading with new construction. As a result, a single project has two toll booths in two different places, such as the upgrading of National Highway 6 combined with construction of Hoa Lac-Hoa Binh road, and upgrading of a 7-km section of National Highway 3 with construction of Thai Nguyen-Cho Moi road. A report of the National Assembly Standing Committee’s oversight team also revealed that the installation of toll booths outside the scope of their projects was common, including the toll booth for Vinh Yen city bypass, which, however, is located on the Bac Thang Long-Noi Bai highway; and the Thanh Hoa toll booth, which is based in Bim Son, etc. The report said the distance between some toll booths was as close as 15 km, such as distance between the toll booth for Ngang pass tunnel in the central region and the nearest BOT toll booth. Based on its conclusions, the Government Inspectorate has asked the Ministry of Planning and Investment, the Ministry of Finance, the Ministry of Construction and the Ministry of Transport to review regulations on public-private partnership for appropriate revision. It suggested imposing strict regulations for investor selection which must go through bidding. Principles and responsibilities in project contract negotiation and signing and in supervision of contract performance should be determined clearly for competent state agencies. The management of work quality and total investment, toll fees and fee collection periods should be performed according to procedures applicable to state-funded works. It recommended reviewing regulations on formulation, approval and management of construction investment costs, particularly unit prices and market price index. Regulations on the structure of funding sources for investment should also be adjusted to diversify funding sources and economic sectors engaged in investment and reduce bank loans to a reasonable level. Specific regulations on form of capital contribution are needed to ensure selection of capable investors, avoiding selection merely based on equity capital stated in financial statements. The national transport master plan should also be revised to add specific and reasonable criteria of toll booths. The fee collection must ensure transparency on the basis of completing a strict process monitored with advanced technologies and allowing compulsory automatic fee collection. 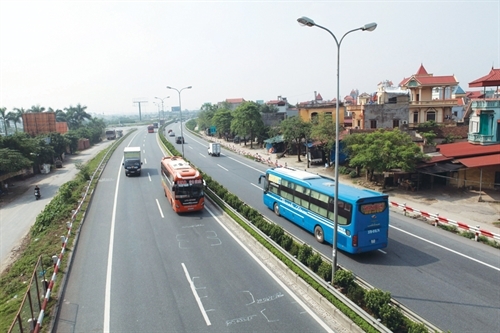 During 2011-16, the Ministry of Transport mobilized over VND 169 trillion for a total of 57 BOT road projects, 55 of which were put into operation. In addition, 43 provinces and cities nationwide had raised over VND 80 trillion for BOT investment. Although BOT projects have helped improved transport conditions in Vietnam, their implementation has revealed major hurdles, including high toll fees and misplaced toll booths, which have triggered strong protests from users, particularly from the beginning of this year. Most recently, the toll booth on National Highway 5 in My Hao district, Hung Yen province, which is set up to collect tolls for another expressway, has been strongly protested for its unreasonable location by drivers who have paid fees with small notes to show their reactions. It took a lot of time for toll collectors to count the cash. Last month, drivers also used small notes to pay tolls at the Cai Lay toll booth in southern Tien Giang province to object to its high tolls and inappropriate location, causing serious traffic jam. Earlier in June, residents in Quang Ninh district, Quang Binh central province, blocked the BOT Quan Hau toll booth with cars to protest the charging through this booth.